A paper published today in Advances in Space Research finds "the reality of a link between long-term changes in solar activity and climate in [Finland-Scandinavia] has been confirmed." 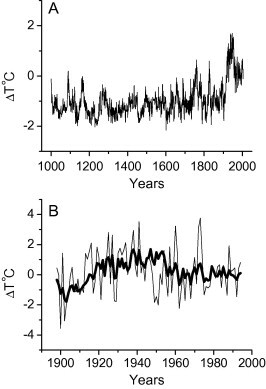 The author's temperature reconstruction from 1000 - 2004 AD finds "highly significant" temperature "oscillation modes, 55–100 year and 100–140 year variations" for which "a probable cause of this periodicity is the modulation of regional climate by the secular solar cycle of Gleissberg." The authors suggest the climate was controlled via solar amplification mechanisms in the lower troposphere. Fig. 1. The five northern chronologies built using RCS. A – Swedish ring width (Grudd, 2008); B – Swedish maximum density (Grudd, 2008); C – Finnish ring width (Lindholm and Jalkanen, 2012); D – Finnish height increment (Lindholm and Jalkanen, 2012); E – Russian ring width ( and ). Fig. 2. 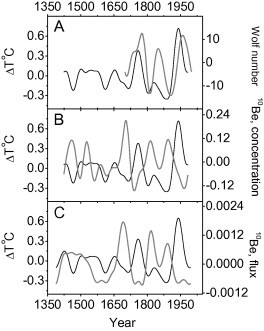 10Be records: A – from Dye-3 core (South Greenland, Beer et al., 1994); B – from NGRIP core (Central Greenland, Berggren et al., 2009). Fig. 4. A – local Morlet wavelet spectrum of T_proxy over 1000–1900. The spectrum is normalized to 0.99 confidence level calculated for red noise with AR(1) = 0.50. B – Fourier spectrum of T_proxy for the same period with confidence level based on red noise with AR(1) = 0.50. SPD is spectral density. C – global Morlet wavelet spectra of T_proxy (thick line), Northern Fennoscandian temperature reconstructed by Lindholm and Eronen (2000) (thin line), Northern Fennoscandian temperature reconstructed by Briffa et al. (1992) (dotted line). The global spectra are calculated over 1000–1900 and normalized by variance. Fig. 5. 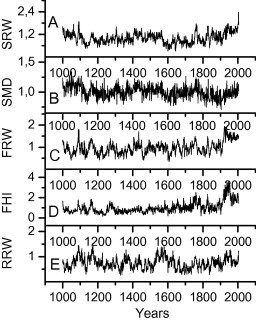 Time series wavelet filtered (MHAT basis) in 61–128-year band. A – Wolf number (gray curve) and T_proxy (black curve); B – concentration of 10Be in Dye-3 core (gray curve) and T_proxy (black curve); C – flux of 10Be in NGRIP core (gray curve) and T_proxy (black curve). A new summer temperature proxy was built for northern Fennoscandia in AD 1000–2004 using parameters of tree growth from a large region, extending from the Swedish Scandes to the Kola Peninsula. 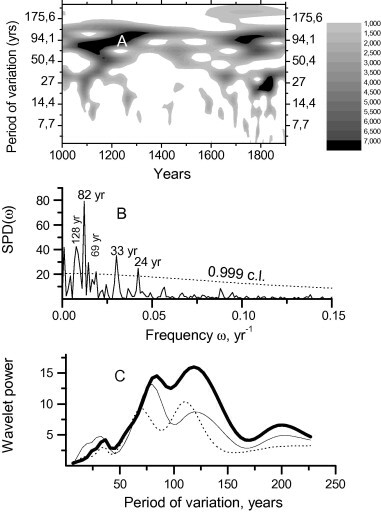 It was found that century-scale (55–140 year) cyclicity is present in this series during the entire time interval. This periodicity is highly significant and has a bi-modal structure, i.e. it consists of two oscillation modes, 55–100 year and 100–140 year variations. 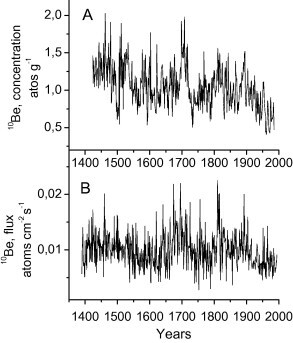 A comparison of the century-long variation in the northern Fennoscandian temperature proxy with the corresponding variations in Wolf numbers and concentration of cosmogenic 10Be in glacial ice shows that a probable cause of this periodicity is the modulation of regional climate by the secular solar cycle of Gleissberg. This is in line with the results obtained previously for a more limited part of the region (Finnish Lapland: 68–70° N, 20–30° E). Thus the reality of a link between long-term changes in solar activity and climate in Fennoscandia has been confirmed. Possible mechanisms of solar influence on the lower troposphere are discussed.